Being able to tell a story in order is an important form of communication and expression. After learning the basics of storytelling, your child will be ready to expand her creativity by creating a fictional story. 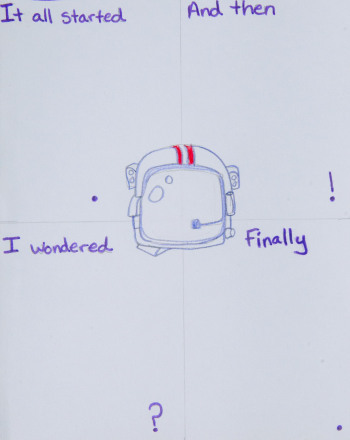 This project will help keep your child's thoughts in order as she creates a story about outer space from the beginning of what happened, all the way through to the end. Each story box focuses on punctuation. The punctuation at the end of each storytelling box will indicate how your child creates her story. Have your child use a marker to divide a sheet of paper into four sections. Ask her to write the following phrases in the boxes (the words should be in order from top to bottom, left to right): "It all started," "And then," "I wondered," and "Finally." At the end of each box, have her write the following punctuation (from top to bottom, left to right): ".," "!," "?," and "." Have her think of a story about outer space she would like to tell. Encourage her to think of something that could happen on another planet or during space travel. She can write down notes or an outline on a separate sheet of paper. Ask her to begin her story using the words already written in the box. She should have at least 3 sentences per box to help move her story forward. The first box should set up her story, the second box will develop the plot of the story and create suspense. This box should include some sort of dilemma. The third box will resolve the dilemma and explain how it was resolved. The fourth box completes the story and may include results or effects of what happened in the previous boxes. 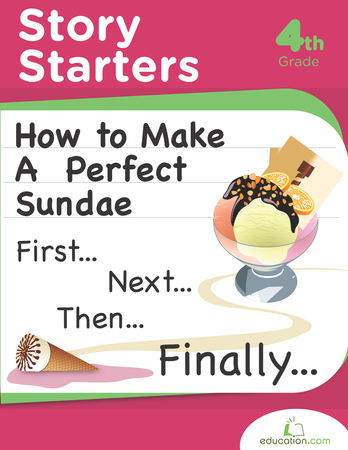 Encourage your kid to use descriptive words and create action to make her story more exciting. The final sentence of each box should correctly make use of the punctuation mark at the bottom of the box. Have her read the story aloud when she finishes. Does she think it sounds like a complete story? Does everything make sense to her? Are there any sentences she needs to edit or remove? When she finishes, have her read her story to friends or family. How would the story be different?